These are our most frequently asked questions (FAQ). Check below to see if we’ve answered your question, and if not, feel free to contact us! 1. I am interested in joining but I don’t know which program is right for me. What is the difference between the two programs you offer? We offer a Basic Training Program (personal group training) and a Strength Training Program (Starting Strength barbell method). Both programs are for anyone who wants to get a great, full-body workout in an hour that will help them get strong, feel better, move better, lose body fat and help improve nagging issues in shoulders or backs. A full description of each program is here. Briefly, if you are a rank beginner, or are interested in a more varied program that encompasses strength, agility, and movement skills, start with our Basic Training program. If maximum strength is your primary goal, choose our Starting Strength program. 2. Are you guys the same as CrossFit? No, we are not the same as CrossFit. However, many of our exercises can also be found in CrossFit workouts. Our pace is very different as is our programming. Our Basic Training program is based around progressions and regressions of basic movements, adjusted to your level of skill, strength and fitness. Our Strength Training program is based on the Starting Strength model and focuses on progressive overload of major barbell lifts. Several of our clients are former CrossFitters and some train with us a couple days a week and also do CrossFit. 3. How long does each session last? Each Basic Training session lasts 60 minutes and includes a good dynamic warm up, core and power work, strength circuit, skills or conditioning and a cool down/stretch. Strength training sessions can last anywhere from 60 – 75 minutes based depending on the day. 4. Do I need to reserve a session ahead of time or do I just show up? You will need to contact us if you would like to drop in to a Basic Training class. If you are interested in our Starting Strength program, you will need to schedule a consultation with us. After your consultation, you will then schedule with a coach to begin your training. You will complete 10 sessions with a Starting Strength Coach. After your 10 sessions, then you can simply show up for any session listed on the schedule for the week. 5. Will I be very sore from these programs? I don’t want to injure myself. Every exercise that we do is scaled to the individual. We encourage everyone to work hard, but more importantly, we want you to work smart and we want everyone to always go at their own pace and compete only against themselves, not the person next to them. We always want you to keep improving. We will never ask you to push through joint pain or force you to keep going when you are so exhausted that your form is suffering. We encourage our members to train smarter, not harder. This means training 3-4 days a week, maximum. Most of our clients work with us 3 days a week and are active the other days. They progress because they understand the importance of rest and recovery. Getting stronger, feeling better and moving better are their goals, not exercising to the point of debilitating soreness. 6. I am a woman and I feel like I bulk up REALLY fast and I am scared to lift weights. Will your programs make me bulky? This is a very common fear many women have when they start doing resistance exercise. It is also very frustrating because while many women complain about this happening to them, most experts tell them, “You’re crazy! Women don’t have enough testosterone to get bulky!” So who is correct? What is the real story? The truth is, for the majority of women, adding a significant amount of muscle is very difficult. However, some women have a body type where they do carry more muscle mass than average and they can gain muscle mass more quickly than average. The main problem I see, is when a woman begins to gain muscle mass, and she does not lose any body fat in the process. Of course you will look bigger… you are gaining something without losing anything! This is why diet plays such a key role. In order for most women to get the look they desire, they must gain some muscle to add curves in all the right places, and also lose body fat to show off the muscle they have gained. 7. Is everyone at your gym in really good shape? There are definitely some people in the gym who are already quite lean and “in-shape.” However, we have a very diverse group of individuals who take our classes, and they are in every stage of their strength journey. Some have been training for a month, others for many years. Some of them can handle extremely intense workouts while others are still easing their way into it. That’s why we scale every exercise in every class to the individual. We are a community with a very encouraging atmosphere. There is no need to feel self-conscious or embarrassed about where you might be in your own journey. 8. The gym down the street from me costs $39/month. I noticed that you charge more than this for one month of training. Why are you so expensive? We actually think we are quite a bargain. When you pay $39/month at your local gym, you are paying for the use of the facility. And that’s it. Use of the facility. At Fivex3 Training, while you are paying for use of the facility, most importantly, you are paying for professional coaching. You are paying for intelligent and well applied programming to ensure that you get stronger, move better and don’t get injured. Our group training classes are small, allowing us to give you personalized and individualized attention. We are able to make modifications to the program to meet your specific needs so that you always get the most out of your training session. Your time is valuable and we want you to get the most out of it. 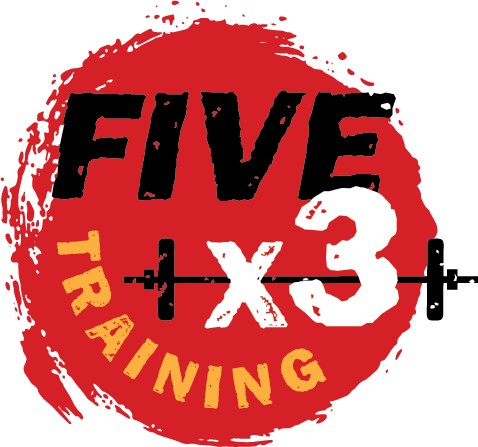 At Fivex3, you get personal coaching in a group setting every time you train. At the gym down the street, if you want personal coaching, you would pay up to $80/session, plus your $39/month. If you scheduled 4 sessions a month, (1xweek), that’s $320 + $39/month = $359/month. Or you could pay $160/month for unlimited training and personal coaching each and every time you come for class. 9. Do you offer any discounts? No, we do not offer discounts. We take just as much time and effort into coaching a student, lawyer, doctor, retiree. Everyone gets the same attention and the same service. 10. I want to lose weight. Which program should I choose? Weight loss is primarily driven by nutrition. While exercise is certainly is important within the context of weight loss, it is a distant second to proper nutrition. Both Basic Training and Strength Training will support a good nutrition-based weight-loss program, as they will help you build and retain muscle mass while you slim down. See question number 1. 11. I have an injury. Can I still come and train? First and foremost you should consult your physician. If you are cleared for exercise, then you can definitely come and train. We will adjust your program to work around any limitations while your injury heals.